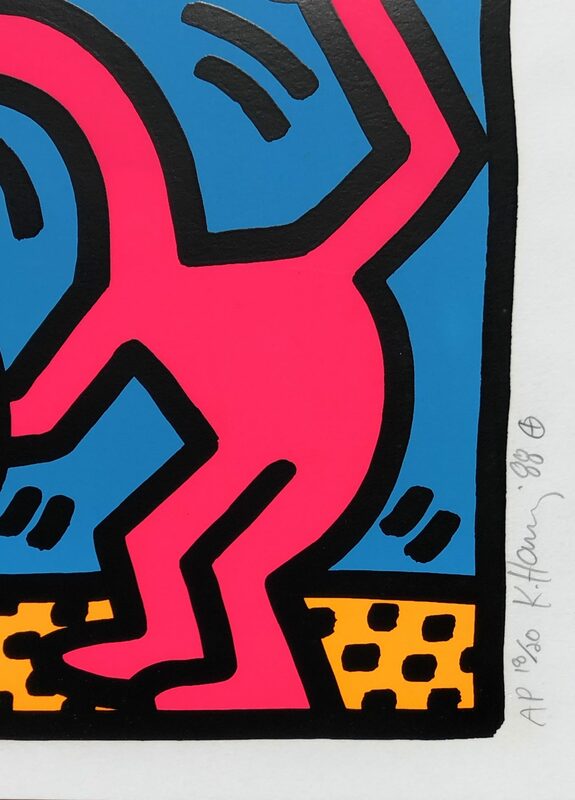 Keith Haring, Pop Shop II is an original screenprint from the AP edition of 20. This print is signed, numbered, and dated in the lower right corner. In April 1986, Haring opened the Pop Shop, a retail store in Soho selling T-shirts, toys, posters, buttons and magnets bearing his images. Haring considered the shop to be an extension of his work and painted the entire interior of the store in an abstract black on white mural, creating a striking and unique retail environment. The shop was intended to allow people greater access to his work, which was now readily available on products at a low cost. 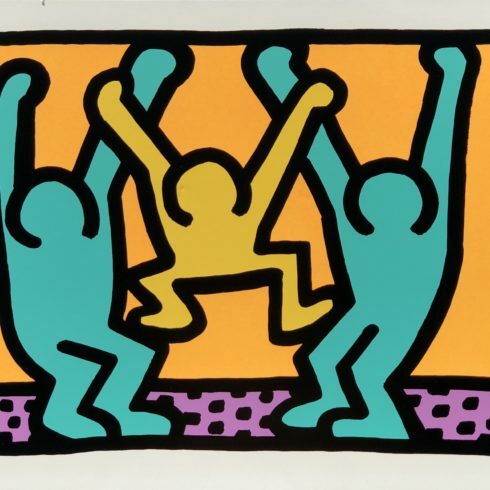 The shop received criticism from many in the art world, however Haring remained committed to his desire to make his artwork available to as wide an audience as possible, and received strong support for his project from friends, fans and mentors including Andy Warhol. 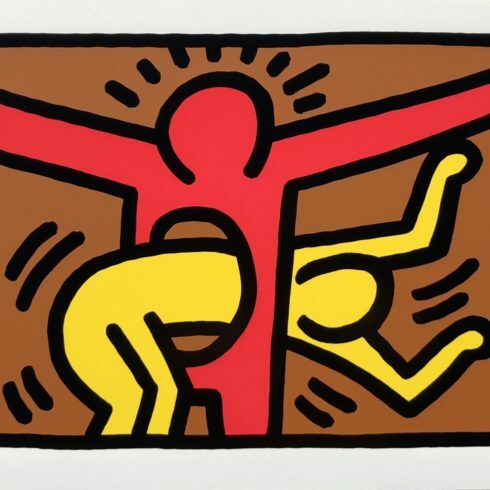 Keith Haring Pop Shop II has been created at this time. 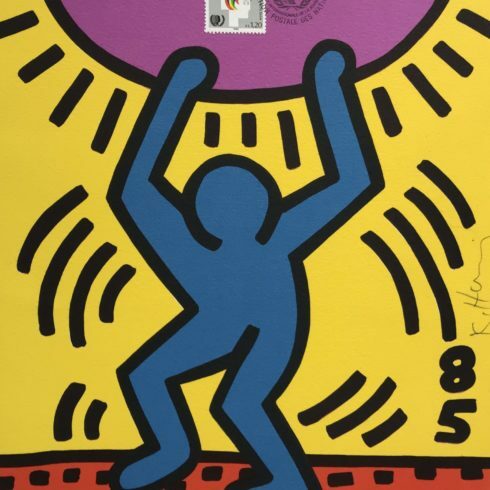 Bridging the gap between the art world and the street, Keith Haring rose to prominence in the early 1980s with his graffiti drawings made in the subways and on the sidewalks of New York City. Combining the appeal of cartoons with the raw energy of Art Brut artists like Jean DuBuffet, Haring developed a distinct pop-graffiti aesthetic centered on fluid, bold outlines against a dense, rhythmic overspread of imagery like that of babies, barking dogs, flying saucers, hearts, and Mickey Mouse. In his subway drawings and murals, Haring explored themes of exploitation, subjugation, drug abuse, and rising fears of nuclear holocaust, which became increasingly apocalyptic after his AIDS diagnosis. 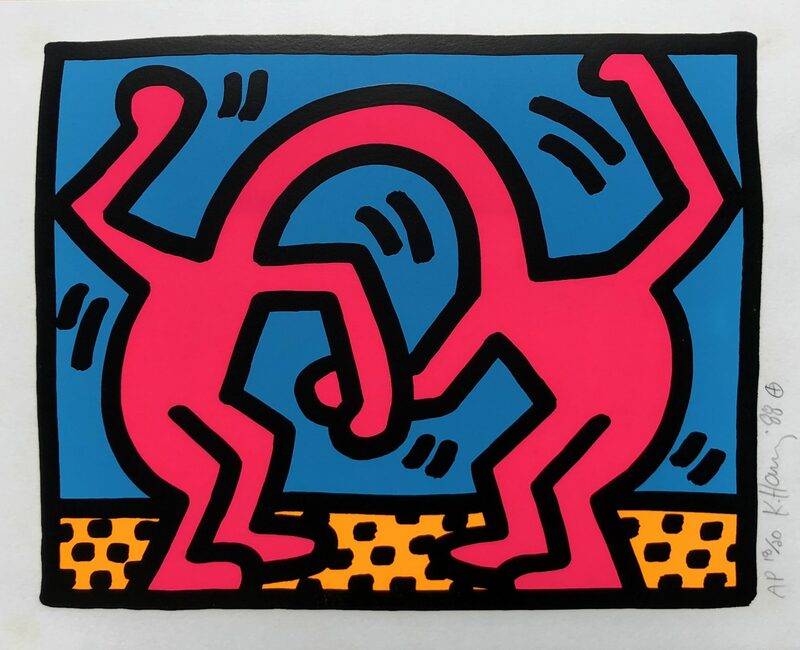 Alongside Jean-Michel Basquiat, Kenny Scharf, and Jenny Holzer, Haring is regarded as a leading figure in New York East Village Art scene in the 1970s and ’80s.